Hello, back in the Keller. I feel very happy that this album has become reality. In the basement a great party has started with all the cool buddies here from wikiloops. It`s a pleasure to celebrate with all of you. The album was created between November 22th and December 11th 2016. So Uli is like a bull dog with your best pair of shoes when you are trying to get them out of it's chewing jaws. Sometimes even a smack with rolled up newspaper to the rear-end the bull dog, wont cause it let it go! You just might as well plan on getting a new pair of shoes. So we have the Keller Party! II as a matter of fact. When I first hear that Pewi and Voodooking were invited into the Keller, I reminded them that their mothers would be ashamed of them. All the sudden I found myself in the Keller........ So I went and got myself a new pair of flip-flops. Now for the review. ALBUMS are cool!!!!! They are a great way to listen to an artist and an artist's point of view, musically....et cetera, et cetera, et cetera. 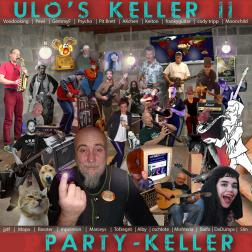 Though Uli's choices for music are thematic there is a nice variety of genres. Take the first tune! Voodooking is obvious a highly skilled player! And Pewi puts in one of his finest plays(IMO) on the flute. SUPER!. Uli just fits so beautifully over the music, like a glove on a hand! Very great start to the album. From that point on, the players and their music is stellar(ha think that's funny don't ya!) and how Uli relates and interprets the music is like--- one million percent far superior than google translate! I mean it seems like all this was worked out before hand. Well don't you think the bull dog is planning to get those shoes...... Such cool, quirky, unique tracks, I think, I'm gonna give up listening to Taylor Swift, Cold Play and Beyonce and just find ALBUMs on wikiloops to listen to. The Show Must Go On !! Ich habe mich richtig auf dieses Projekt gefreut. Allein die Idee ist genial, dann sind da Deine guten Texte und nicht zu vergessen, deine unglaubliche Stimme. Wahrscheinlich ist es nicht schwer zu erraten, ich bin ein Fan und bin stolz, mit euch allen im Keller zu sein. I was really looking forward to this project. Just the idea is awesome, then there are your good lyrics and not to forget, your incredible voice. Probably it is not difficult to guess, I am a fan and am proud to be with you all in the basement. Used to be we thought of wine...no longer the cellar is where to find talent surrounding our philosophical and metaphorical host. A mix of fun and fear of the outside world. Come in, get comfortable, listen, play, loose yourself...you won't want to leave. Ulo at his very best. Ich hatte schon einige Lieder davon gehört, und jetzt nochmal das ganze in einem Stück. Tolles Projekt! Super Lieder, Album Cover, concept, alles gut. Das einzige schlechte is das ich nicht mit dabei war im Keller :( Sonst echt Klasse! !